Main Street, Barre, Saturday, June 7, 3 P.M.
Before exploring the Green Mountain Motorheads Car Show in Barre this weekend, I had to get myself in the right state of mind. So, I stopped at the Pit Stop Diner on Main St. for a dose of NASCAR memorabilia and a bacon cheeseburger. Loaded with a belly full of grease, I hit the block, where scores of cars were lined up with their hoods popped. I found that if I gave the cars a good once-over and nodded at the owner, people thought I knew what I was doing. Truth is, I don't know the first thing about cars. I kept doing it anyway, because it helped take my mind off the fact that I was wearing jeans and a black T-shirt on a 90-degree day. 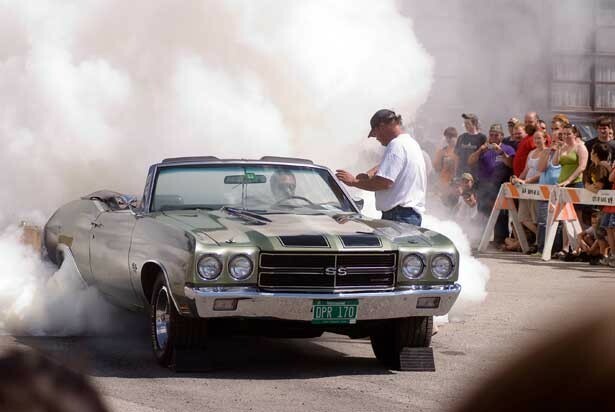 The car show seemed to have two parts: the show itself on Main St. and the "burn-out" contest that ensued later. I found the show to be almost intellectual, like an art exhibit. The owners weren't exactly conceptualizing their automobiles like pieces of art, but criticisms and accolades were definitely shared and discussed. The only difference is that the car owners, unlike artists, were able to drive their work home. The "burn-out" contest was a different story. It took place in a back alley where hordes of men were hollering and waving their shirts in the air. It amazed me to see the piles of smoldering rubber being swept off the pavement after each car burned out. Sometimes there was so much smoke that I couldn't see the car anymore. Those were the real crowd pleasers. Afterwards, as I was walking back to my own car, I heard Del Shannon's "Runaway" come on the loudspeaker. Immediately, I felt an urge to roll a pack of cigarettes in my shirtsleeve, steal one of the vintage pickups, and race Harrison Ford down Thunder Road. I guess car shows will do that to you.